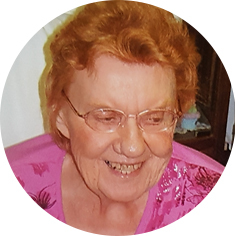 Millie Olga Regimbald (née: Chubak), aged 91 years of Moose Jaw, SK passed away peacefully on Monday, March 4th, 2019 at the Dr. F.H. Wigmore Regional Hospital. Millie was born to the late Michael and Rosalie (Krasna) Chubak on February 14th, 1928 in Rivers, MB. After high school, Millie remained in Rivers and worked as a switchboard operator for the town. At a dance hall one weekend she met a “tall, dark and handsome” military man, Gaston ‘Reg’ Regimbald, who became the love of her life. They were married on July 16th, 1953 and were married for 49 years before Reg passed away on December 12th, 2002. After the marriage, Millie embarked on a journey as a military wife, a life which wasn’t always easy. The family had to move every few years and as a result Millie had to pull up roots time and time again. One thing that remained constant throughout her life was her piano, which came along with the family for every move. Millie loved to play the piano. She played with her whole heart and soul and you could feel the passion in each and every note. She also loved to dance and sing. Despite the many moves throughout her early life, Millie made many lifelong friends. She was able to finally settle down in Moose Jaw when her husband retired from the military in 1974. She enjoyed her ‘golden’ years and loved her home. She also adored her grandchildren and they brought her much joy. She was predeceased by her parents, Michael and Rosalie; husband, Gaston, and brother, Joseph. Millie is survived by her children: Cynthia (Harv) Rasmussen of Campbell River, BC, Carol (Lee) McNee of Edmonton, AB, and Rosemary (Keith) Schick of Moose Jaw, SK; grandchildren: Kurtis Rasmussen, Erik and Adam Schick; great-grandchildren, Evelyn and Jacob Rasmussen; as well as numerous nieces and nephews.The Funeral Service will be held on Saturday, March 9th, 2019 at 11:00 a.m. in St. Joseph’s Roman Catholic Church, 1064 3rd Ave NW, Moose Jaw, SK. Father Hector Seville will officiate and interment will take place in Rosedale Cemetery. As an expression of sympathy, donations in Millie’s name may be made to Parkinson Canada, 610 Duchess St, Saskatoon, SK S7K 0R1. Arrangements are entrusted to Moose Jaw Funeral Home, 268 Mulberry Lane. James Murdock, Funeral Director 306-693-4550.